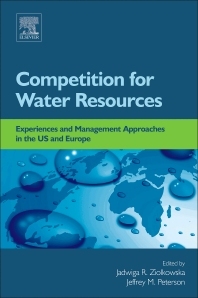 Competition for Water Resources: Experiences and Management Approaches in the U.S. and Europe addresses the escalation of global issues regarding water scarcity and the necessary, cost-effective strategies that must be put in place in order to deal with escalating water crisis. The book evaluates use and competition for water resources in the U.S. and Europe, emphasizing the problems and challenges of dealing with tradeoffs in water. In addition, the book discusses water management strategies that can be used to optimize water use and allocation, mitigate water scarcity, and adapt to water scarcity. Supplementing the numerous case studies, the book includes lessons learned from applying specific strategies and approaches. This comprehensive overview and comparison of management practices across two continents is an invaluable resource for researchers, policymakers, and educators in water. 4. Wishful Thinking or a Dangerous Mismatch? 3. How Important Is Irrigation to US Agriculture? 4. How Efficient Is Irrigated Agriculture? Chapter 3.3. Comparison of Water Management Institutions and Approaches in the United States and Europe—What Can We Learn From Each Other? 5. Conclusions: What Can We Learn From Each Other? 2. Should We Attempt to Satisfy Demand For Water or Curtail It? Jadwiga R. Ziolkowska is an assistant professor and environmental economist in the Department of Geography and Environmental Sustainability at University of Oklahoma. She was a post-doctoral scholar at University of California at Berkeley and an EU Marie Curie Fellow in the 7th Framework Program. She was also a researcher at University of Texas at Austin. She received her PhD and Habilitation, both in agricultural economics, from Humboldt University of Berlin. Her research areas include sustainability evaluation and decision-making support in the field of natural resources, environmental, bioenergy, agricultural economics, and resource management. Her current research focus is on optimizing water management systems, desalination, biofuels, food waste economics, geospatial and spatio-temporal analyses. Jeffrey M. Peterson is the Director of the Water Resources Center and a professor of Applied Economics at the University of Minnesota. He earned his Ph.D. from Cornell University in agricultural and resource economics. Prior to coming to Minnesota he was a faculty member in the Department of Agricultural Economics at Kansas State University for 15 years, serving as Director of Graduate Studies from 2014 to 2015. He also held a 1-year visiting faculty appointment at Oregon State University. His research focuses on environmental policy analysis with an emphasis on water use and water quality impacts related to agriculture. He is a member of the Scientific Advisory Council on Optimizing Water Use in Agriculture for the Foundation for Food and Agriculture research and an editor of the Journal of Agricultural and Resource Economics.